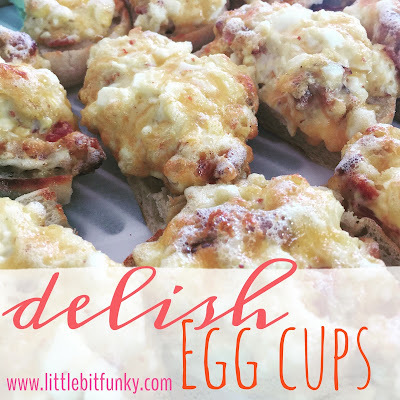 These egg cups are great to make the night before, in fact, I think some time in the fridge makes them even better! Even if you don't like egg salad, TRY these! They are pretty amazing and their simplicity makes them an even better treat! They were a huge hit with friends, Doug and the church crowd! Combine all ingredients and top muffins accordingly. Refrigerate overnight. When ready to serve, pop under the broiler for 2-3 minutes. Serve immediately and refrigerate the leftovers, no need to reheat when you eat them again. I actually prefer them cold! Just found your blog by looking for a headboard on Pinterest, then noticed today's recipe is one I've made many times! Yes, it is always a HUGE hit; we make it ahead and heat it up quickly as part of a brunch for company. Going to check out your happy blog now, thanks!